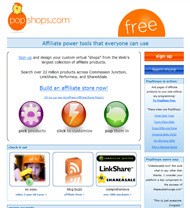 Popshops.com is a site which allows you to download an ultra useful and innovative tool that allows you to plug-in your affiliate accounts and select individual products from all merchants to sell on your sites. For example, if you create a site selling fine handbags and you need to populate that site with items for sale, you can use Popshops to select a Prada handbag from one CJ merchant, a Gucci handbag from another CJ merchant, a Marc Jacobs handbag from a shareasale merchant - all with a drag and drop fully graphical interface which displays photos and descriptions of each product - very cool! Description From Website: PopShops is the largest searchable collection of affiliate products (over 22 million and growing) that spans all of the major networks. With PopShops you can Pick, Click, and Pop products on to your website or blog in minutes (we refer to those product layouts as “shops”) . Check out Popshops.com - they just added a Wordpress plug-in - nice! This entry was posted on Monday, September 24th, 2007 at 9:53 pm and is filed under Site of the Day. You can follow any responses to this entry through the RSS 2.0 feed.